Appeal a Small Claims Court Case – Can I appeal? An appeal of a small claims court judgment is a request to the superior court to change the small claims court judge’s decision. 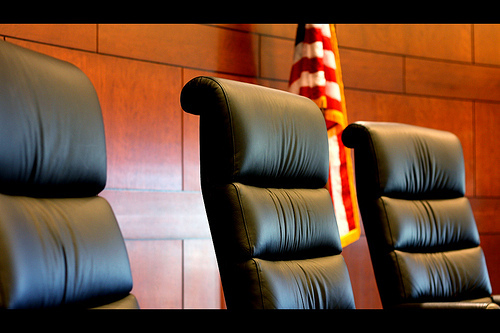 This entails another hearing and you must present your case again. What is a “trial de novo”? One name for a small claims appeal is a “trial de novo” which is a fancy legal term for “new trial.” This means that your case is decided by a brand new judge from the beginning so you have to prepare for appeal all over again (like you prepared for the initial hearing). The appeal takes place in the civil division of the superior court (not the small claims court division). Because of this key difference, both you and the other party are allowed to bring an attorney to represent you at the new hearing. Who can file an appeal in a small claims case? Short answer–only the defendant. Long answer–the plaintiff can also file an appeal but only if the defendant has filed a counterclaim against the plaintiff and the defendant prevails on the counterclaim. Since an appeal for a small claims case is a new trial, the entire case is decided again from the beginning. How is a small claims appeal filed? The appeal must be filed within thirty days of the date the small claims judgment was mailed to you. This date will appear on your copy of the small claims decision. You must file a Notice of Appeal (Small Claims) (Form SC-140) with the small claims court. After you file the Notice of Appeal, the court will mail you the date and time of the hearing on the appeal. As mentioned above, the hearing will be in the civil decision of the superior court (which may be at a different courthouse than the courthouse you appeared at for the first hearing). If you do not appear at the appeal, the judge will not hear your side of the case. What happens at the trial on the appeal? A new judge will hear all the evidence again and renders a decision. The judge does not know what happened at the first trial, so this judge looks at the case as if it was being decided for the first time. As stated above, either side may be represented by an attorney at a small claims appeal. It is possible the judge may award you up to $150 in attorneys fees and $150 for your actual loss of earnings, transportation expenses, and lodging that you incurred for the appeal. Additionally, if your side can prove the other side filed the appeal in bad faith with the intent to harass or delay you, or to encourage you to not pursue your claim, the judge may award reasonable and actual attorneys fees of up to $1000 and $1000 in actual loss of earnings, transportation expenses, and lodging incurred (and that are reasonable). For example, if the judge finds the appeal was not in bad faith, you may have had to hire an attorney for $250. Even though it cost you more than $150, you may only recover that amount unless there is bad faith. The same goes for loss of earnings, transportation (think mileage) and lodging (if the court is far from where you live). What happens after the decision on the appeal? The decision on the appeal is final meaning it cannot be appealed again. …and are the plaintiff, once the court sends you notice that you have won the appeal, you may proceed with collection of your judgment. There is no 30-day waiting period like there was after the original small claims trial. (The purpose of the thirty day waiting period was to allow for the defendant to appeal). …and are the defendant and you completely win the appeal, you owe no money. You will have to pay the original judgment (or more if the judge found that you owe more on appeal). The judge may order you to pay for the plaintiff’s court costs (such as filing fees and cost of service). Interest accrues at the rate of 10% each year the judgment is not paid. As mentioned above, you may be ordered to pay up to $150 in attorneys fees to the plaintiff as well as $150 in costs associated with the appeal (transportation, loss of earnings, and possibly lodging). The worst thing that can happen to you is that the judge finds that you filed your appeal in bad faith. The judge could award up to $1000 in attorneys fees and $1000 in travel costs (and loss of earnings). You filed your appeal to encourage the other side to drop their case.